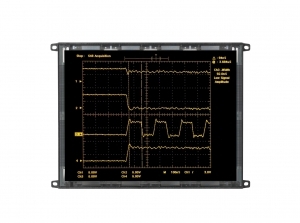 The EL6648MS – Planar EL Series display is an Obsolete Electroluminescent (EL) display. Capetronics has the capability to repair and most certainly we do have a brand new retrofit kit that is form, fit and function the same as the EL6648MS. We see a lot of glass substrate damage with these EL6648MS displays. Granted they have lasted a lot longer than any other display technologies from the 1990’s which is proof that thin film electroluminescent displays are rugged industrial displays. However although most of these display perform longer than MTBF specifications they still fail eventually. That’s where Capetronics comes in. We have brand new retrofit solutions that still use robust thin film electroluminescence technology.